Two horse-drawn carriages pass under the arch at the Imperial Palace (Hofburg), Vienna. 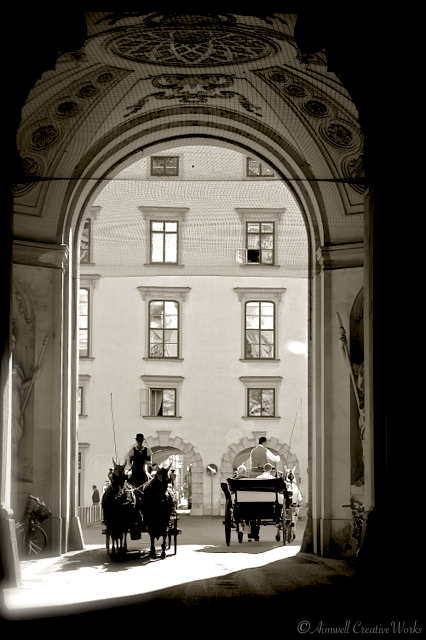 This entry was posted in Equestrian, Photography, Travel and tagged Aimwell CreativeWorks, Austria, black and white, Dorothy Chiotti, Equestrian, Equine image, Hofburg, horse-drawn carriage, Leanne Cole, monochrome, Travel, Vienna. Bookmark the permalink. As photographers (or wannabes) our job is to be in the right place and ready, and then recognise the magic when it happens. Harder than you would think. This photo just wouldn’t have been as good if both carriages had not been passing at the same time, not to mention the light and the editing being perfect. And what are the chances?? Nice work, Dorothy.